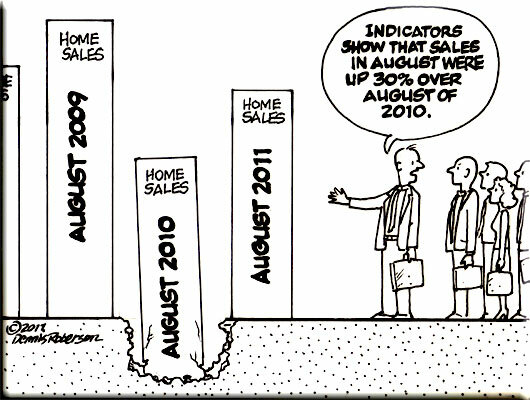 The Chronicle on 09/21/11 reports Houston home sales up 33% in August over August 2010. 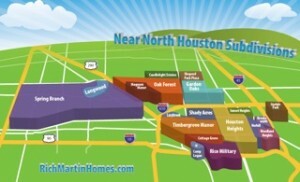 Houston Home Sales…How Are They, Really. Single-family homes sales rose sharply in August, jumping 30 percent over last year, the association said. Sales totaled 5,543, marking the third straight monthly increase this year. All segments of this area’s housing market saw higher sales in August – from properties less than $80,000 to the $500,000 and above range. Townhouse and condominium sales jumped 19.5 percent. The number of people who bought new homes fell for the fourth straight month. Sales this year are on track to finish as the worst on records dating back half a century. 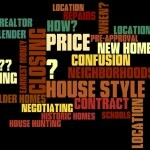 The local housing market continued to favor buyers last month, although that may be changing. At the end of August, there was a 7.1-month supply of homes for sale – meaning it would take that long to sell all the homes on the market based on recent activity, according to the Houston Association of Realtors. A year ago, the area had an eight-month supply. Houston home sales volume is about 30% higher over the previous August…but…the previous August just sucked. 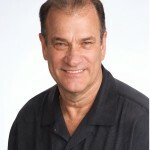 Most people bought a house earlier in 2010 to take advantage of the expiring tax credit. So, sales are up over last August all right, but still lower than 2009 August sales. 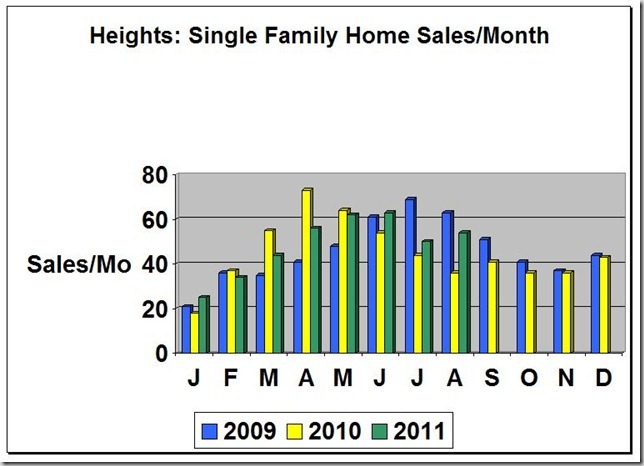 See Monthly Sales Chart for the Heights below. The green bar is 2011…compare it to the yellow 2010. New Home Sales are terrible all right, but it doesn’t tell the whole story. Build it and it will sell (inside the Loop anyway…I know little about the suburbs). New homes still sell quickly inside the loop, but there just aren’t many being built. Builders cannot borrow money for “spec” homes. The ones who are still building either have cash, deep pockets, or private investors. 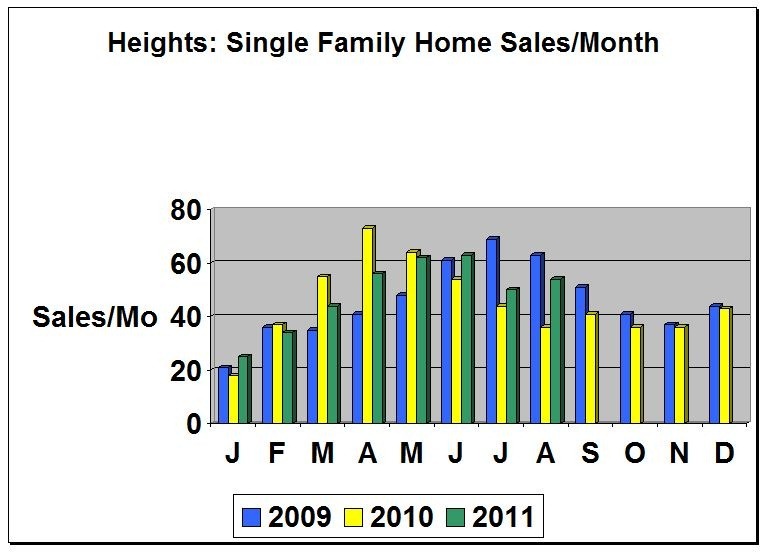 New homes accounted for 35% of home sales in the Heights pre-recession; now they are closer to 10%. That in turn accounts for the poor sales of lots and tear-downs. It does however keep new home prices strong. Buyer’s Market? Probably….the cute/clean sparkling home still sells fast though. 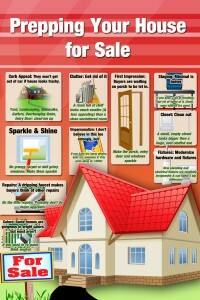 If you are selling a house now, make it shine; put some money into it if you can. A 5-6 month inventory is considered neutral: above that becomes a Buyer’s Market. So, our current 7 month inventory tilts slightly to the buyer. My prediction for the future? I gave up predictions. I’m the guy who bought a house in the 80’s thinking I got a great deal. The seller owed $70K and I paid $50k for it….a bargain right? Two years later it was worth $40K. Oh well. But…..I do know this. 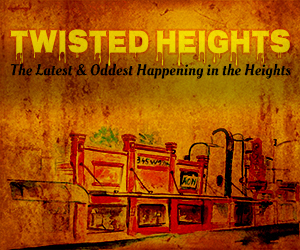 Heights prices are solid! My little Woodland Heights house on a big lot is part of my retirement plan. Nice havin’ ya on the planet Rich. See you at the cookout.